Imogen's Typewriter. 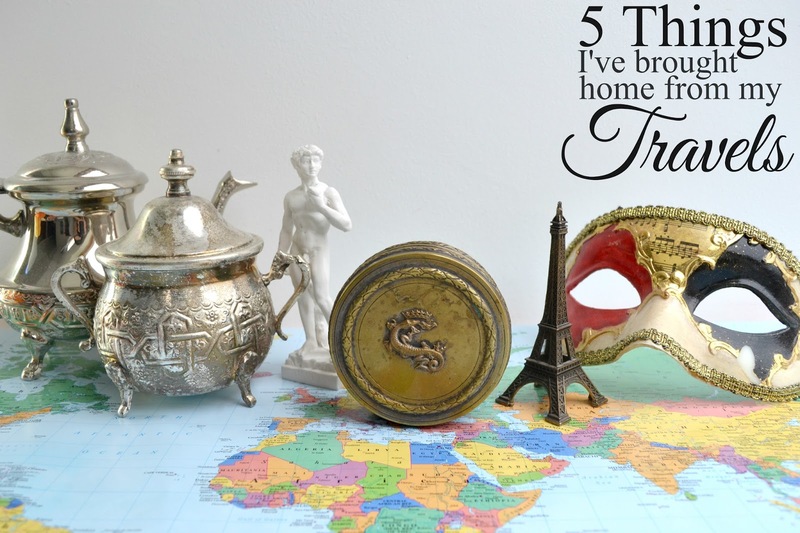 : 5 Things I've brought Home from my Travels! 1. A Moroccan Tea Set! I went to Marrakech a couple years ago and it was a really interesting trip. I'd never been to anywhere in Africa before so it was great going to a new continent. One of my absolute favourite things about the area, apart from the baking, was the mint tea. I'm sure anyone who has been knows exactly why I was in love with it and drank it all the time. So when I was doing some holiday shopping I went off and found my own teapot and sugar bowl, and they came home with me. 2. A Statue of David from Florence! I've been to Florence a couple times in my life. It's where my parents went for their honeymoon and they really love going back so I've tagged along with them. I was especially interested in going after watching Season 4 of Jersey Shore when they stay in Florence. Side note: The pizza place they worked at, Pizzeria O'Vesuvio, is the best pizza I've ever had in my life. The statue of David is just one of those cliché touristy things that you end up buying and he stands proud on my shelf. 3. An Antique Tin from the South of France! I picked this up in a little antiques store in a little town that I honestly can't remember the name of. It had a pickled snake in a jar, it was a little weird. Either way, I just remember finding the markings on the top absolutely beautiful and it came home with me to store my spare Euro change. I'd love to find out a bit more about it but I have no idea where to start. 4. An Eiffel Tower from Paris! I have climbed all 674 stairs of the Eiffel Tower. Admittedly it nearly killed me, but I did it because I'm stubborn and when I get an idea in my head I really want to do, I do it. To commemorate this I have my lil' one, it's so cute and convenient for wrangling cellotape off parcels when I can't be bothered finding scissors. I went to Venice when I was a teenager and a friend of mine was having a masquerade party a couple weeks after I got back, so what better place to get a mask! It must have been just after I redecorated my room in red and black- oh young Imogen why- because I wanted the mask to match. It's really beautiful and it makes me sad that it has a chip in the paint after so many years. Do you collect from your travels?